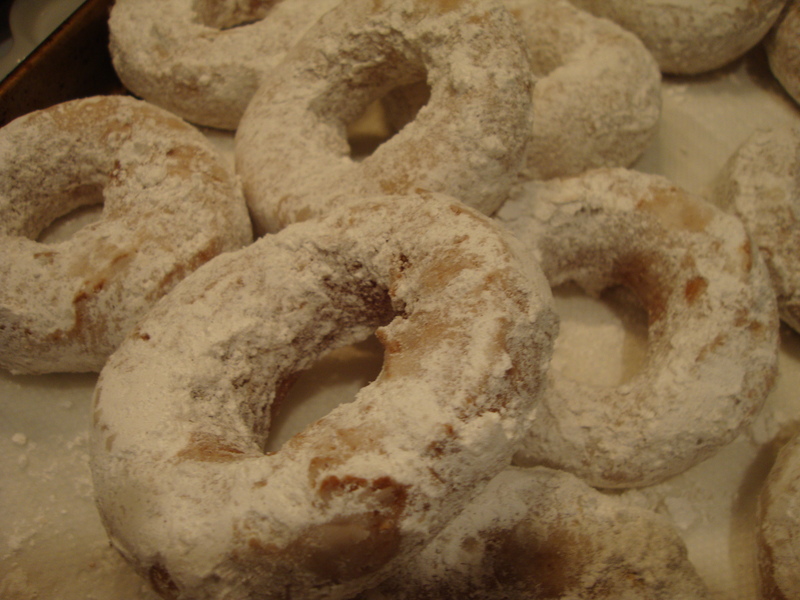 Inspired by the snow-white powdered sugar donuts on the cover of the current Better Homes & Gardens magazine, honorary Three Points cook Amy suggests whipping up a batch. So we decamp to her kitchen on the New Jersey side to try it out. 1. Going old-school for recipes from tried-and-true sources like the Better Homes & Gardens cookbooks pays off. The recipes are so well -tested that they work off the bat. This one was originally from the 1953 version of the familiar red-plaid-cover cookbook and following it exactly worked perfectly. No wonder cookbook collectors prize the BH&G cookbooks. 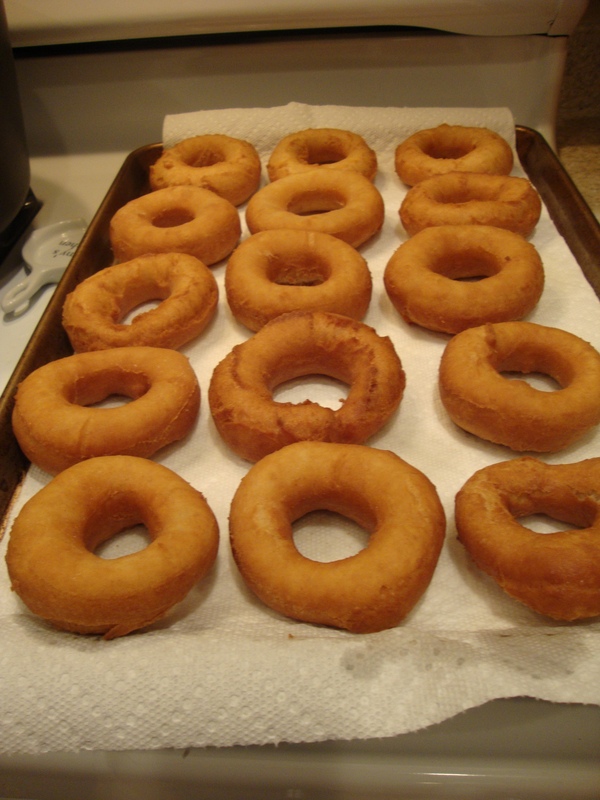 I always turn to it for basics like pies and yes, doughnuts. 2. Improvisation is still a good thing. 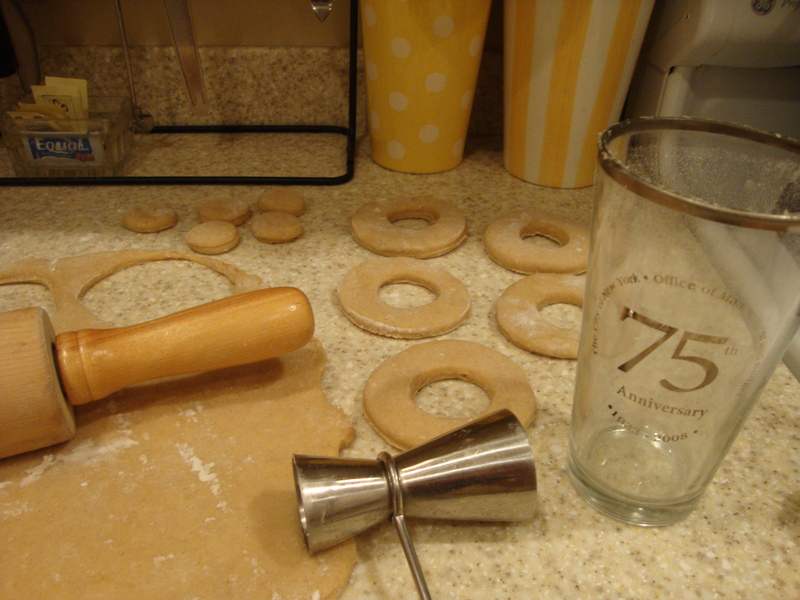 Without a doughnut or biscuit cutter, we used a drinking glass (NYC Office of Management and Budget 75th anniversary edition, courtesy of Amy’s former co-workers) and a cocktail jigger for the doughnut hole. Success! The size was perfect, giving us the exact number of doughnuts the recipe suggested. Last improv, a touch of ground ginger added to the powdered sugar and cinnamon coating. This would also be a great chocolate doughnut recipe, adding some cocoa to the batter. Do pay attention to the recipe’s instruction that this will be a sticky dough. It is, but with the recommended chilling time, it rolls out into a beautifully soft and pliable dough. Resist the urge to add more flour at the start.